Are you all done holiday shopping for your kids? How about getting all those little odds and ends to add to their stockings? If you still have a few things to get and don't want to fill your child's stocking with sugar rush candy, why consider Pirate's Booty aged white cheddar baked rice and corn puffs snack? My family loves Pirate's Booty snacks, as well as their line of mac and cheese products. And, recently, I had the chance to introduce my daughter's preschool class to Pirate's Booty baked puff snacks when I brought in a few bags of their aged cheddar cheese rice and corn puffed snack for snack time. The kids loved it, including those who had gluten allergies. The teachers told me the kids kept asking for a refill of their snack cup. And, when I came to pick Savannah up, I overheard a few of the kids telling their moms about the great tasting cheddar snack they had at snack time and asked if they could get some for home. I am familiar with Pirate's Booty aged white cheddar baked rice and corn puffs snack that comes in 4 oz. bags, but was happy to learn yesterday that this family favorite snack also is available in 1 oz. bags, perfect for on the go snacking, or to give to kids at home to enjoy as an afternoon snack or when watching movies. And, as the holidays approach, I see these 1 oz. snack bags making for the perfect non-candy idea to add to your child's stocking. Kids can enjoy the aged white cheddar baked rice and corn puffs snack from Pirate's Booty as they open up their gifts, or afterwards when they are playing with the toys, or waiting for the holiday dinner to be ready. 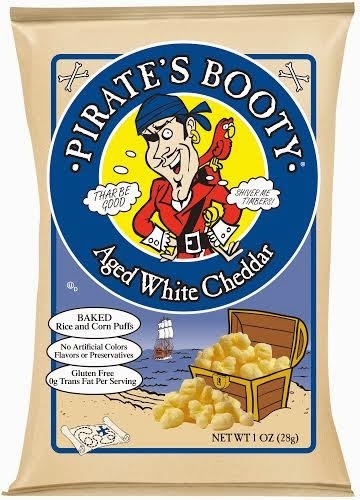 You can find Pirate's Booty aged white cheddar baked rice and corn puffs snack in the snack aisle of your favorite local retailer, as well as through the Pirate's Booty website as well as Amazon.com. To learn more about Pirate's Booty and their line of products, visit: http://www.piratebrands.com/pirates-booty/snacks. I have not yet tried this but it sure sounds yummy and I love snacks.